As George Michael said sagely (and with poor subject/verb agreement, I might add) in song, “There’s things that you guess and things that you know.” You know the rest of the ditty and what he wants. But me? 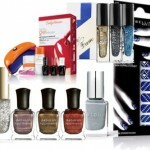 MAC, Deborah Lippman, Napoleon Perdis, Charlotte Ronson and Urban Decay—I want your FLECKS. It’s natural–well, mica is, anyway. It’s chemical. It’s logical. Habitual. It’s sensual. Here’s one thing I don’t have to guess: my favorite sparkly delights for fall. MAC Marilyn Dazzle Glass ($21.50) Well this is the gloss to end all glosses. Decorated with icon Marilyn Monroe and dripping with gold glitter, I couldn’t love this more than if it came with a teeny British nitpicky book about grammar (my other favorite thing in addish to gloss, gold glitter and Marilyn). 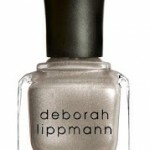 Deborah Lipmann Polish in Let’s Go Crazy ($18) is a non-sheeritating purple cream with multi-colored glitter in varying sizes. And the shout-out to Prince? Always appreciated. NP Set Eyeliner Duo in Los Cabos ($18) Two different shades of gold, one glittery, one more metallic. Can you even? (You can’t.) Not everybody does it, but everybody should. Charlotte Ronson Starry Eyes Liquid Eye Shadow ($18) I discovered this liquid shimmery slip of an eye shadow at the Sephora in Honolulu this summer and it enchanted me with its gossamer goodness. Get involved. Urban Decay Build Your Own Palette in Rock ($18) is a customizable palette that comes with an exclusive eye shadow in Rock, a dark taupe with silver glitter. What’s your definition of [flirty], baby? Don’t you think it’s time you had flecks with me? 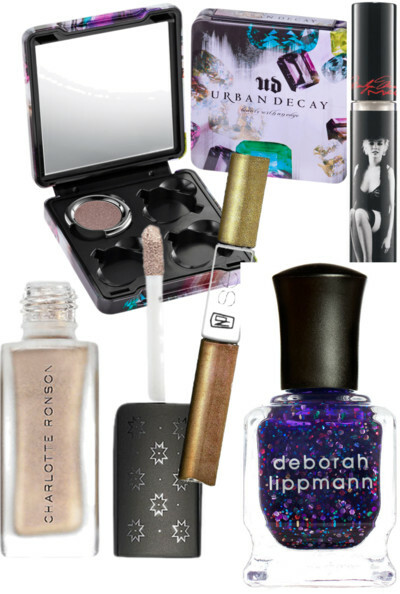 What are your glittery favorites of the moment? What’s On Jamie Allison Sanders’ Vanity?